For Christmas, I received a book of historic beer recipes. 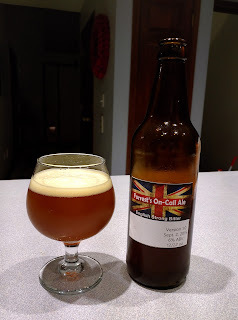 I ordered the ingredients for an English Bitter that looked interesting because it called for Saaz hops instead of one of the more traditional varieties like UK Goldings. I decided to make it and ordered the necessary ingredients. When brew day came around, I learned that either I had ordered the wrong amount of Pale Malt, or the shop had shipped me less than I ordered. I had only 8 pounds instead of the 10 required. I decided to substitute two pounds of CaraVienne malt for the missing two pounds of Pale Malt rather than abort the brewing session. I also overlooked the invert sugar called for in the recipe, and substituted some Brun Fonce sugar I had on-hand, which is similar. At this point, I realized that what I was making was no longer the ale from the book, but something of my own design. That being the case, it was no longer the historic beer but something new. Given that, I decided to experiment a bit more and add some Cherrywood Smoked Malt I has on-hand as well. 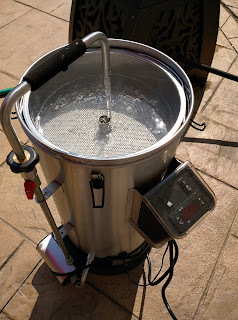 The grains were placed in The Grainfather RIMS brewing system with 4.5 gallons of water. The grain was stirred to ensure it all got wet, then the recirculation pump started. The mash water was heated to 152F and held there for 60 minutes. The temperature was then raised to 156F and held there for 20 minutes. An iodine test came up clean, indicating a good starch conversion. For the first 30 minutes of the boil, nothing was added to the wort. After 30 minutes of boiling, the German Northern Brewer hops were added in a cotton bag. After 60 minutes, the Czech Saaz hops were added in another bag. At 80 minutes, the Brun Fonce sugar was added, along with a Whirlfloc tablet and yeast nutrient. At 90 minutes, the heat was turned off. The hops bags were removed, and the wort was pumped through a counter flow wort chiller into a santitized stainless fermenter. The wort left the counter flow chiller at 79.3F. When it cooled to 76F, I oxygenated it with an oxygen tank and stone, then pitched the yeast. The beer remained in the primary fermenter until bottling, when I transferred it to a sanitized bottling bucket. Mangrove Jack's carbonation drops were used for priming the beer. One drop per 12 ounce bottle and two per 22 ounce bottle seemed to work well. This brewing session was actually quite a learning experience. This was my first full brew using The Grainfather brewing system, and my second all-grain batch ever. I learned a lot about The Grainfather in this session. One thing I learned was that the built-in scorch protection can be tripped easily during a brewing session. The problem with this is that the reset switch is underneath the unit, so you have to tilt the entire device (filled with hot wort) to an angle that allows you to reach underneath it to get to the switch. My wife had to help me with that on this batch. Apart from that issue, the brewing session went flawlessly and The Grainfather performed as designed. I also learned from this experience that it's important to double-check your grain order at the time you order it, when you receive it, and before brewing. In this case, I don't know if I didn't order the right amount of grain (8 pounds vs. 10) or the supplier shipped the wrong amount. It doesn't matter at this point, since the beer is made and turned out fine, but I need to remember this for the future. I also need to double-check my recipes, too, since I somehow missed the invert sugar when I placed the grain order and when I wrote out the first draft of my brewing instructions for the session. I don't think the brewing process could have been much improved on. The Grainfather performed well apart from tripping the scorch protection once. Since then, I've built a small wooden stand for it to sit on so that I can reach the reset button when brewing. Color: Pours a slightly hazy deep amber to light brown color. The thin beige head doesn't last long and is for me a disappointing part of this one. Aroma: Has a hint of fruit to it, and some malt. Doesn't quite smell like a Belgian beer, but not quite like an English one either. This could be the Brun Fonce sugar. Could be the yeast. Flavor: It's definitely malty. There's a hint of smoke, but it's hard to detect. The aftertaste is mildly bitter. Replace the Brun Fonce sugar with an appropriate invert sugar. Control fermentation temperature better to reduce yeast stress and off-flavors that might have crept into this one. Increase the hops addition. This one wasn't cloying or sweet, but could do with a bit more hops bitterness and perhaps an aroma addition. Add some dextrine or wheat malt to give it more of a head and better head retention. All things considered, this was an easily drinkable beer. It doesn't have much character to it, though. It's very basic, and even a little bland. I've definitely made better. Although it may surprise many homebrewers to hear this, I've only brewed one IPA before this. I would never have brewed that one if it hadn't been part of the Mr. Beer kit I received at the time. Unlike most craft beer fans these days, especially here in Central Ohio, I'm just not an IPA fan. I understand what fans of the style like about it. A good mix of hops can add complexity to the flavor and aroma of a beer. I just don't care for the bitterness, in the same way many people don't like their food to be very spicy. So the fact that I purchased and have brewed a recipe kit for a clone of Russian River's famous and well-loved Pliny the Elder DIPA would shock many who know me. I decided to do this for three reasons. First, I've never actually tried Pliny. You can't buy it in Ohio, and I've never bumped into it in my travels out of state. Since many consider it to be one of the best beers in the world, making a batch would be a way to sample it here at home. Second, there are members of my family who prefer IPAs or drink only IPAs. This would give me a beer to offer them when the come to visit. Finally, I figured brewing a beer with so many hops additions would be an interesting learning experience that could transfer to other beers I might want to make in the future. 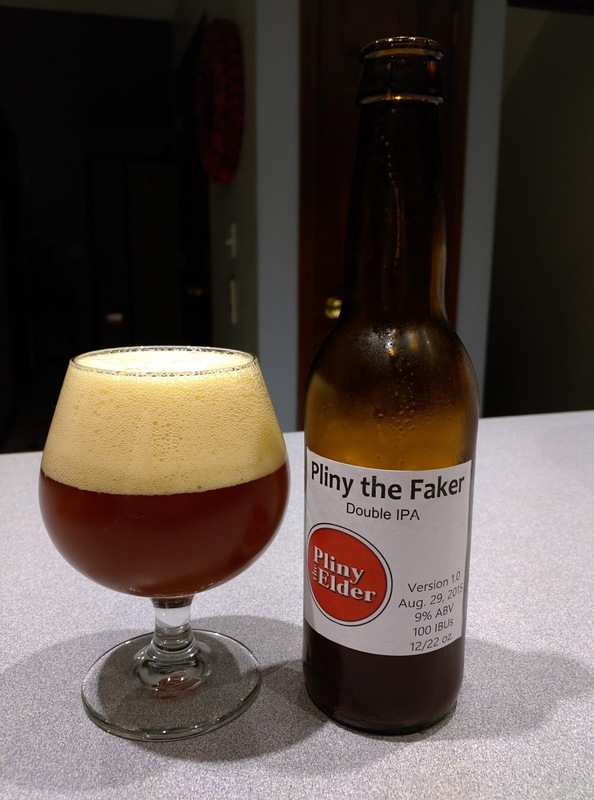 MoreBeer's Pliny kit was developed by the brewmaster at Russian River, so it should be as faithful a re-creation as any an homebrewer might make. When it went on sale recently, I decided to pick it up and try it. Heat 5 gallons of water to 155F. Steep the 2 ounces of whole Cascade hops and the Crystal 40L in this for 30 minutes. Remove the grain and hops and bring to a boil. Remove from heat and add the LME, DME, and maltodextrin. Return to a boil. At 90 minutes of boil, turn off the heat. Add 2 ounces of Centennial to the bag and 1 ounce of Simcoe. Remove from the stove. Run cold water through the wort chiller until the temperature is below 80F. Use gravity to transfer the wort through a sanitized rubber tube into the sanitized fermenter. When primary fermentation finishes in approximately 5-7 days, I'll then add 3 ounces of Columbus hops pellets, 1 ounce of Centennial hops pellets, and 1 ounce of Simcoe hops pellets to a sanitized muslin bag and drop into the fermenter for dry-hopping. These will spend another 5-7 days in the fermenter before bottling. I'll bottle with carbonation drops rather than the corn sugar supplied with the kit as I've had good results with the drops. My wort registered a gravity of 1.074. I haven't done a color measurement. The yeast was very happy with the beer and on the second day of fermentation leaked a bit of beer out the airlock and over the edge of the fermenter. After seven days in the fermenter, I soaked a muslin bag in Star San and loaded the dry hop pellets into it. The fermenter was opened and the hops bag dropped in, and the fermenter re-sealed. According to BYO Magazine, the ideal dry hop timeframe is 3-5 days. More than this can cause grassy flavors to appear. On the third day of dry hopping, I transferred the beer to a sanitized bottling bucket and bottled it. I carbonated with corn sugar and water, which I don't often do. The yield for the batch ended up being 26 bottles of the 12-ounce size and 12 of the 22-ounce bomber variety. Estimated ABV was 8.2% (final gravity 1.012). The MoreBeer instruction sheets are decent, but I prefer to have my instructions in a form that shows me the exact order and timing of the brewing steps. That meant I needed to sift through their general instructions and the recipe-specific instructions to work out what they recommended doing and when. This took me several minutes to sort out, but made the brewing process much easier to follow. As for the recipe itself, I've never brewed anything with this much hops in it. The recipe contains almost a pound of hops in a 5-6 gallon batch, which is an incredible amount to me. Beer Tools Pro estimated that the beer will be 147 IBUs, 7.78% alcohol by volume, 8.35 SRM, and original gravity of 1.079 (which is higher than my actual OG reading of 1.074). Given the amount of hops and malt extract in the kit, it's priced reasonably on the MoreBeer web site, and even more so when you can pick it up at a discount. Taste: Pine, grapefruit, malts and hops compliment each other. Bitterness is smoother than many other DIPAs. So it looks like the clone can be compared favorably to the original. I'm not a big fan of the Pale Ale and IPA styles (and their kin) but I found this beer a nice change of pace from the maltier styles I normally drink. I don't know that I'll ever brew it again, but I've learned to never say "never" in my lifetime. Perhaps when this batch runs out I'll feel the need to do another hoppy one. Update 8/6/2016: Thanks to a family member on the west coast, I recently acquired a bottle of the real Pliny the Elder beer. Another family member and I did a side by side taste test of the two. Because my bottle was almost a year old, the hops aroma had decayed almost completely, leaving the clone with a malty, sweet aroma. The real beer's aroma was much more complex, dry, and hoppy. The flavor of the two was extremely close. Neither of the tasters could discern a difference in hops flavor in the beer, though my older clone was understandably a bit sweeter. The main difference between the two was in the color. As you can see in the photo above, the clone beer is very much an amber color, nearly brown. The real beer is a gold color. The color difference, in large part, is probably due to this being an extract based beer and not an all-grain version. I suspect that the More Beer all-grain kit would yield a lighter-colored beer that, when fresh, is very much like the real Pliny the Elder. 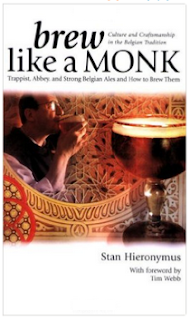 I recently finished reading Brew Like a Monk by Stan Heironymus, which is a book I strongly recommend if you want to brew a great Belgian-style beer. The author spoke with many experts in Belgium about their brewing practices, recipes, equipment, ingredients, and history. As a fan of Belgian beers styles, I learned a lot from the book. I'll share some of that here. The most important thing to learn is that Belgian brewers try things that brewers in other parts of the world would not. They'll experiment with grains, adjuncts, yeast, fermentation chamber geometry, and more, in a quest to make a beer they enjoy. Many breweries, in fact, create a number of beers that are popular and "pay the bills" while creating a few that are intended only to satisfy the curiosity or taste of the brewmaster. One interesting point in the book is that the Belgian brewmasters recommend that Americans not try to create a carbon copy of an existing Belgian beer, but instead to brew a beer intended for American beer drinkers that uses elements from the Belgian brewing playbook. It's not that they view us as competition, but more that this is what they are doing in Belgium - creating beers that match the Belgian palate and sensibility. They recommend that Americans do the same. As you read the book, you'll see two things. First, that each Belgian brewery, brewmaster, and beer has some elements to its ingredients, brew process, brewing equipment, etc., that are unique to it. This means that no single set of guidelines and methods will allow you to produce a beer that is identical to your favorite Belgian ale (assuming that is your goal). Still, as you read the book and consider the recipes and techniques within it, you'll realize that there actually are some generalizations and similarities between the various Belgian breweries and what they do. Recognizing these could help you produce a much better Belgian-style beer. Belgian brewers tend not to be slaves to specific formulations, mashing schedules, etc. They treat what they're doing as a form of art and focus more on what they want for an end result (e.g., the flavors, color, mouthfeel, aroma) than what goes into the beer and how it's made. Most bottled Belgian Trappist ales are refermented in the bottle. The beer is usually given both fresh sugar and fresh yeast during bottling. In some cases, this yeast is the same as used to brew the beer initially. In others, it's a different yeast, often a wine yeast. It's common for yeast to be cropped during high krausen and used to referment and/or to produce the next batch. The thinking here is that the yeast becomes accustomed to a particular recipe or style and will ferment better. Eventually though, fresh yeast is used. For lighter-colored beers, sucrose is often used in place of the candi sugar rocks commonly seen in the USA. Belgian brewers don't believe it changes the flavor. Sugar is used primarily to "dry out" the beer and offset the malt sweetness to make the beer more "digestible" by consumers, as well as higher in alcohol content. Sucrose (table sugar) adds gravity and lightens the body of a beer. Caramelized sugar adds dark beer flavors like rum that dark sugar alone can't. Turbinado sugar can add some of those same notes. Most Belgian brewers start fermentation in a temperature range near 68 degrees Fahrenheit and allow it to climb as high as 84. Usually they try to pitch on the low end of the yeast's tolerance. While some do put temperature control in place, many let the yeast "go wild" and do what it will, driving temps up or down as it goes. Brewers who use temperature control generally step the temperature up gradually during fermentation. Many have a secondary fermentation stage that takes place in low temperatures (like 32-50 Fahrenheit) over a period of weeks. The most common hops varieties used are Czech Saaz, Hallertau, Styrian Goldings. Others appear occasionally, but are far less common. Brewers generally view the hops as a balancing element in the flavor, not a dominant one as American brewers tend to do. The higher the level of malt extract (LME, DME) in your recipe, the less sugar you should add to the wort. Most Trappist beers have a BU:GU (Bitterness Units to Gravity Units) ratio of 1:2 or less. It's recommended that you aim for a 3:8 ratio for most beers, higher for a tripel and lower for the darker styles. Most Belgian beers use only noble hops for aroma. Some don't use aroma hops at all. As I noted earlier, these are generalities gleaned from reading all the stories in the book about the Belgian breweries. If you read each case in the book by itself, you'll find that not all of the above statements are true for every brewery and beer discussed in the book. My goal above is to give you some general suggestions that you can use in any Belgian-style brewing effort. You'll have to discard or adjust the guidelines based on your needs and results. New Belgium ferments their stronger Belgian style beers in the mid 60's (Fahrenheit) based on the flavor profile of their yeast. High-gravity beers with Belgian yeast strains tend to produce high levels of fruity esters. High fermentation temperatures and lack of oxygen accentuate that. New Belgium adds oxygen at the time of yeast addition, as well as a small amount of zinc and yeast nutrient. Hull doesn't recommend homebrewers use oxygen stones or bubbling air through the wort unless you have a sterile way to do it. Ommegang tries to keep its fermentations around 79F (26C) because this is the temperature their yeast ferments best at and they want good ester production. Linehart recommends that homebrewers ferment the beer in a room that is not too cool and remains at a consistent temperature. Linehart recommends yeast starters to ensure good yeast health. Ommegang's recommended pitch rate is 1 million cells per milliliter per degree Plato of original gravity. For example, if pitching a wort with an OG of 19, pitch 19-20 million cells per milliliter. Linehart says that most of the higher-gravity Belgian style beers are brewed using a large amount of highly fermentable sugars like dextrose or candi sugar. This boosts fermentability and results in a drier, more drinkable beer. The biggest problem Cilurzo sees is that Belgian-style beers don't finish fermenting to a low enough gravity, perhaps due to not enough yeast being pitched or not enough oxygen in the wort. Cilurzo recommends starting with a lower original gravity wort and having the beer finish at a lower gravity to wind up with a drier beer with the same alcohol content it would have had if it started with a higher gravity. Russian River ferments its Belgian style beers at 62F (17C) for the first couple of days and then lets it free rise up to the ambient room temperature. This keeps fusel alcohol down as well as some of the bigger esters and phenolics. Russian River aerates their wort but doesn't use yeast nutrients. They use oxygen rather than compressed air. Cilurzo says that when he was a homebrewer, though, he used an aquarium pimp with a stainless steel carbination stone. Westmalle, Westvleteren, and Achel all use the same yeast from Westmalle. Achel pitches at 63-64F and increases temperature to 72-73F during fermentation in cylindro-conical tanks. Westmalle pitches at 64F and rises to only 68F during fermentation in closed, square fermenters. Westvleteren pitches at 68F and reaches 82-84F in open fermenters. If fermentation exceeds 84F, they will try to slow the temperature increase. Unfortunately, their strain of yeast must be treated carefully as cooling too much causes it to go into a survival mode and shut down. In such cases all you can do is pitch fresh yeast. Brasserie Caracole pitches at 77F and allow the yeast to ferment as it will, getting as high as 86F in the summer and as low as 68F in the winter. Duvel pitches at 61-64F and lets it rise as high as 84F over 5 days. They say that starting at a lower temperature leaves some fatty acids behind for ester production which are otherwise used by early yeast growth. Westmalle pitches only 5-6 million cells per milliliter for its 19.6 Plato Tripel, which is just over 0.25 million cells/mL/Plato. Jolly Pumpkin lets fermentation start in the upper 60s (Fahrenheit) and finish in the mid-80s. Allowing fermentation temperatures to gradually rise throughout fermentation helps retain esters and attenuation without getting solventy notes. To increase the amount of air the wort is exposed to, try using multiple fermenters. This reduces the height-to-width ratio of the wort and can reduce fermentation temperature increases. Chris White of White Labs said that when fermenting a Belgian style ale, "I'd go shallow, and I wouldn't even put an airlock on." White also says that Belgian yeasts show a low degree of flocculation and may require filtration or an extended period of conditioning time to get the beer clear. Beers with more than 10% of their fermentables as sugar will tend to attenuate further, and even more so at higher temperatures. Pitching a little less yeast will give more flavor during growth, but pitching too little causes solventy flavors. It's important to find the right balance. I may add more notes here as I read more. Much of the flavor in Belgian beers comes from the yeast. Belgian yeast can give off flavors that are mistaken for various fruits and spices, when those fruits and spices are not included in the beer at all. Therefore, one of the biggest factors in getting the "right" flavor for a Belgian-style beer is getting the yeast to produce the right flavors. Pitch rates, fermentation temperatures, and the geometry of your fermenter all play a role in this. Pizza Port, an American brewery known for its Belgian beers, overpitches cell counts and undercuts oxygen at knockout, forcing the yeast to produce esters. Fermentation starts at 64 degrees Fahrenheit and is allowed to run without any temperature controls. If you're worried about under-pitching, this could be an option. The shape of your fermenter and the depth-to-width ratio also appears to affect ester production. Most Belgian brewers aim for a 1:1 ratio in order to get the best from their yeast. Some even incorporate open fermenters. It's said that at home brewing volumes, fermenter geometry might not play much of a role, as home fermenters tend to be closer to a 1:1 ratio than commercial fermenters. Still, this is something you could experiment with by splitting a batch into multiple fermenters to get something closer to a 1:1 ratio. The book also mentions that cylindro-conical fermenters can reduce the production of esters. If you're not getting the flavors you want in a conical fermenter, it may be time to switch to a bucket, carboy, or other vessel with a flat bottom. What I've shared in this post is a small subset of what you'll find in this excellent book. It shares Belgian brewing history, connections between the many famous Belgian breweries, commentary from brewmasters, recipes, analyses of popular Belgian beers like Chimay and Westvleteren, and more. If you're a fan of Belgian beers and home brewing, you should definitely read the book. In June, I brewed what was probably my fourth batch of Belgian style Tripel ale (I didn't keep good records until last August so I'm not sure how many attempts there have been). Each batch I've made has gotten a little better. This one was no exception. I brewed it from an ingredient kit, supplemented with different yeast, coriander, and sweet orange peel. When I took the last sample from the fermenter for testing, it smelled and tasted great - though obviously flat. As I often do, I bottled this beer following my usual process. I cleaned and sanitized my bottles. I did the same with my caps. I dropped a Fermenter's Favorites carbonation drop in each bottle, filled it, and capped it. The bottles were placed in my basement inside a cooler, to stabilize the temperatures and provide protection should a bottle burst open. I left them for two weeks and put one bottle in the refrigerator. The next day, I pulled out the bottle, popped off the cap, and instead of the usual "hiss" I heard... nothing. The beer was flat. This really upset me because up to that moment it was the best Tripel I'd made. Start by moving the bottles to a warmer location, somewhere that tends to stay near the upper limit of the yeast's ideal range. This will give the yeast the best chance of carbonating your beer as-is. If two weeks in a warm climate (80 degrees F) doesn't help, try making a small amount of a wort strong enough to generate a krausen. When the yeast begins to generate the krausen, uncap a bottle, inject some of this active yeast from the wort into the bottle, and re-cap. Give it two or three weeks. If that still doesn't work, try opening the bottles and putting some dry champagne or wine yeast in the bottle, then re-capping. If it still doesn't work, try opening the bottle and adding a carbonation drop to it. The risk here is that the bottles could burst with the extra sugar. If there is a brew-on-premise facility near you, they may have a force-carbonation system for bottled beers. If so, you could ask for time to use it to carbonate and re-cap the beer. You'll probably have to pay for the service. If you have kegging equipment, you could keg the beer and force-carbonate it. Warmer location: This worked for the last few bottles from the bucket, which probably had the most yeast in them. (It also told me what the problem most likely was - flocculation.) All of the bottles from earlier in the process did not yield a result. Adding Yeast: I tried adding "a few grains" of dry Montrachet wine yeast to some bottles and more in others (enough to cover the top of the beer inside the bottle). None of those bottles seemed to carbonate, despite being kept in a range of temperatures that the yeast would have tolerated. So, either there was nothing for the yeast to work on or the yeast didn't activate. Adding an Active Yeast Culture: I decided not to try this, or adding sugar. The next time I do a high-gravity batch, I'll try adding an active yeast culture before bottling. This is what many Belgian brewers do with their high-gravity beers and may be the best option. Update 09/27/2015: I thought I had a second batch come out flat, but it turned out to be my mistake and bad brewing journal-keeping. I thought it had been bottled for two weeks, when it had only been bottled for one. A bottle opened last night came out properly carbonated. I have a package of CBC-1 Cask and Bottle Conditioning yeast that I may try activating and pitching into a small starter wort to see if dropping a live, active yeast culture into the bottles of the flat tripel makes any difference. Update 10/08/2017: I've had another batch fail to carbonate. I decided to do an experiment in this case to see if I could get that beer to carbonate in the bottle. See my post on Rescuing an Undercarbonated Beer for more information. If possible, an "all-in-one" system. If not, as few points of failure as possible. 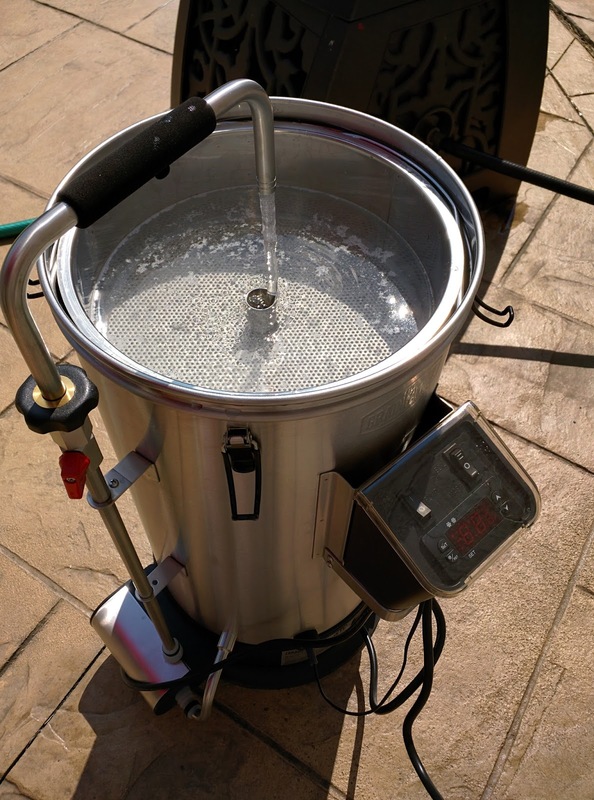 The Grainfather met these requirements quite well, at a Kickstarter cost of $840. Other products I'd been looking at had more bells and whistles, but were priced at least twice that. So I took the risk that the Kickstarter would fall through and paid my money for the Grainfather. The device arrived in August 2015. I spent my first few weeks getting to know it, and not actually brewing anything. I made sure there were no leaks from my assembly of the device, made sure the pump worked, made sure the heating element worked, etc. 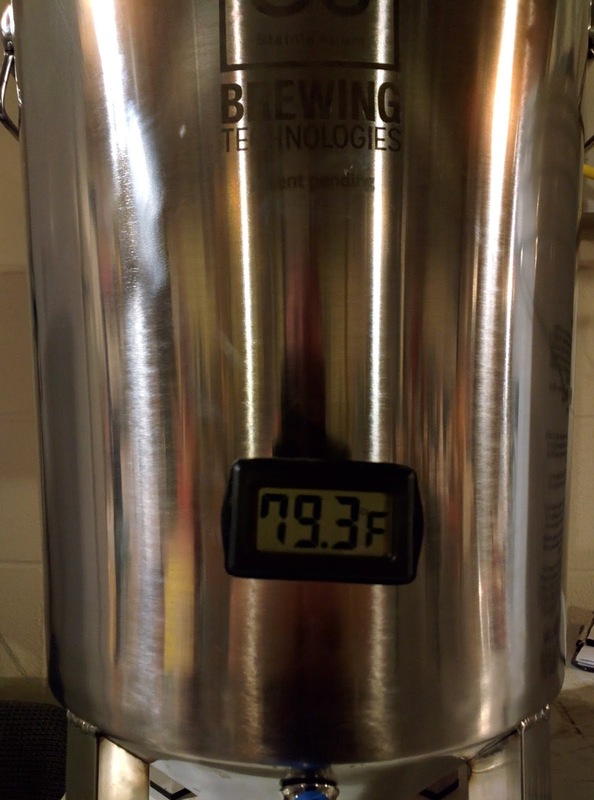 I also tested heating and boiling times to get some idea of how long it would take to brew a batch of beer with The Grainfather. For the rest of this review, I'll walk you through the process and share my observations and experiences as I go. Being made of stainless steel, The Grainfather probably arrives at your door with a residue of oils and chemicals used during its manufacture. Users of The Grainfather outside the USA, and the instruction manual provided with the device, tell you to run a cleaning cycle through it before you actually brew with it. This is sound advice. I've read stories of people upset that their first couple of batches made with The Grainfather (and other stainess equipment) have tasted like they were laced with industrial chemicals or machine oil. I actually ran two cleaning cycles through mine and rinsed it repeatedly before using. When the rinse water coming out of The Grainfather tasted like clean tap water, I decided it was ready to use. The Grainfather's cleaning process is relatively easy. Put two or three gallons of water into it and follow the directions on a container of PBW (Powdered Brewer's Wash) to add the right amount into it. Then, wipe down the sides of the unit with the PBW solution and a soft cloth that won't scratch the steel. Plug in The Grainfather, set the temperature for 131F, and turn on the recirculation pump with the recirculation arm attached. Run PBW through the pump and arm for a while, then attach the counterflow chiller and recirculate PBW through that. After 20-30 minutes, use the recirculating arm and a length of hose attached to the arm to pump the PBW out. Dump any remaining PBW and rinse the inside of The Grainfather well. Then fill The Grainfather with clean water and run that through the pump, recirculating arm, and chiller again. With the Grainfather clean and ready to use, it's time to begin brewing. You start by identifying your recipe, gathering and weighing your ingredients as you normally would. When the recipe tells you how much water to use for mashing and sparging, you ignore that. Instead, you follow a formula in The Grainfather manual to calculate the correct volume of mash and sparge water based on the amount of grain your recipe requires. You have two options for sparge water. (This sounds like I'm jumping ahead, but bear with me.) You will either use The Grainfather to heat the necessary quantity of water to boiling, then pump it into a heat-resistant vessel to wait while you mash, or you will heat water in some other vessel while mashing. Using The Grainfather to heat the sparge water will take longer, as you'll need to heat the water, set it aside, and then heat more water in it to get the quantity needed for mashing. However, using the Grainfather to heat the sparge water means that you don't need some other heat source. Once your sparge water option is chosen and the sparge water is taken care of, it's time to mash. You do this by adding the amount of water The Grainfather requires based on the grain bill. Then you lower the grain basket into the boiler. Pour in the grain, stirring to make sure it all gets wet. Put the perforated lid on top of the grain but not compressing it. Now, you set the temperature on the controller, switch on the pump, and wait while The Grainfather gets the mash water to the appropriate temperature. When the appropriate temperature is reached, you set a timer (on a smartphone or other device) for the mash time specified in the beer recipe. The Grainfather's electronic controller will keep the mash within a degree or two of the desired temperature. You can do step-mashing by changing the setting on the controller at appropriate times. I find that it tends to take about 30 minutes to get the mash water to my desired temperature. Once there, The Grainfather will tend to keep it very close to the temperature you've set. For example, if you set it to 155F, you'll see it between 153 and 156 pretty much constantly. If you do the occasional extract batch, The Grainfather is an excellent way to keep the temperature under control during steeping as well. When you're finished mashing, insert the handle into the grain basket and carefully lift it out of the boiler. Once it's out, turn it until the clips on the bottom line up with the metal rods in the top of the boiler. Set the basket down and it will remain on top of the boiler. (I forgot to take a photo of this.) With a large grain bill, the basket can be pretty heavy to lift, but it's manageable. After sparging, you remove the grain basket. Discard the grain responsibly. I recommend doing this and cleaning the basket with PBW and fresh water while the wort boils, as it will save some elapsed time for the total brewing process. Since you'll be waiting for the boil anyway, you might as well get the cleaning out of the way. To begin the boil, you set the heating element mode switch to Normal and the switch on the electronic controller to Boil mode. It's a good idea at this point to use a spoon or paddle to scrape any trub off the area of The Grainfather where the heating element is. If you don't, you may trigger the scorch protection. This will prevent the heating element from working until you press the reset switch. The problem with this is that IMake has located the reset switch underneath The Grainfather. This means that to reset the heating element you have to tip the boiler full of hot wort to one side and reach underneath it to depress the switch. For a device that is otherwise filled with good safety features, this seems like a particularly risky activity. Since this initial brew, I built a small U-shaped platform on which to set The Grainfather so that I can easily reach the switch if necessary. The scorch protection in The Grainfather seems to be pretty sensitive. I've triggered it two out of three times I've used the device. The first time I used it as a steeping kettle for an extract-based beer I made on the kitchen stove. The second time I used it for the all-grain batch depicted in this article. The first time I triggered it, I thought I'd broken The Grainfather. It was only later that I learned about the reset switch and used it. Depending on your mash water temperature, it may take up to an hour to get the wort to boiling. In my experience , The Grainfather's heating element raises the temperature inside the kettle by 1 to 2 degrees (Fahrenheit) every minute with a 5-6 gallon volume. Assuming you finish your mash near 165F, you'll need to raise the kettle contents to 212F (47 degrees). This takes about 45 minutes in my experience so far. You can shorten this time, as I noted earlier, by switching the unit to boil mode while sparging. By the time you finish the sparge, the kettle will probably be at 180F or so. This will shorten the boil time to about 30 minutes. I added hops pellets in muslin bags to The Grainfather during the boil. This seemed to work well and kept hops gunk out of the kettle. I had no trouble with the scorch protection during the actual boil and was able to complete the batch without incident. About ten minutes before the end of the boil, you hook up the counter flow wort chiller provided with The Grainfather and direct the wort-out line into the kettle. Turn on the pump and flow hot wort through the chiller to sterilize it for later use. At the end of the boil, turn off the pump and heating element. Put the wort-out line into your fermenter. Attach the cold water supply to the wort chiller and place the hot-water-out line into a kettle or drain. (Draining into a kettle gives you hot water to use for cleaning The Grainfather and reduces water usage, provided you have a vessel capable of holding such hot water.) After the water is flowing smoothly out of the chiller, turn on the pump and begin pumping hot wort into the chiller. I placed the airlock in my fermenter and left it to continue cooling while cleaning The Grainfather, discarding the used grain, and otherwise cleaning up the brewing area. By the time I'd done that, the wort in the fermenter had dropped to around 76F which was within the range my yeast could safely tolerate, so I pitched it. 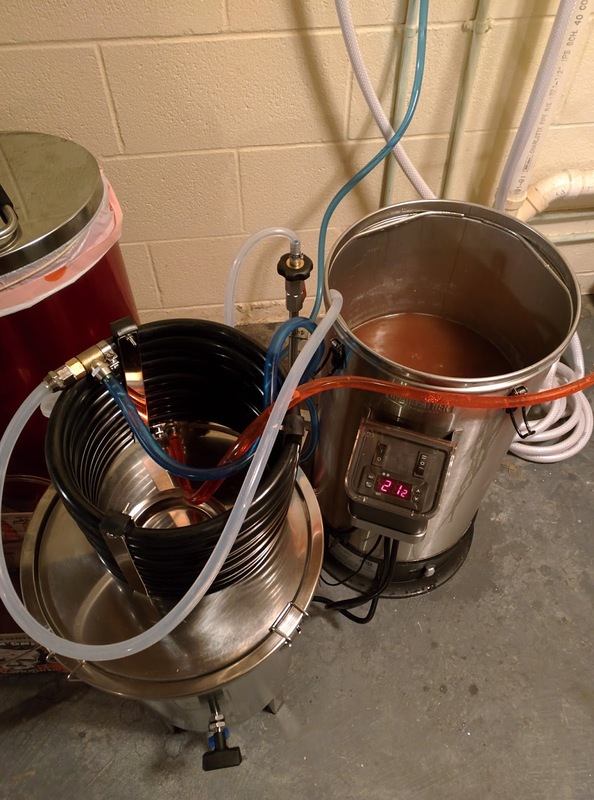 Update: Since the original post of this article, I've found that recirculating the wort into the kettle after the boil is over can help further reduce the temperature in the fermenter. I turned off the heat, turned on the cold water through the counter flow chiller, and pumped the wort back into the kettle. I kept things this way until the kettle temperature read approximately 150F. Then I shut off the pump, moved the cold wort hose into the fermenter, and started the pump again. This reduced the in-fermenter temperature to approximately 76F. I suspect that in the winter when tap water temperatures drop below 72F I will be able to get an even lower wort temperature. As I noted at the beginning, I only recently made the transition from extract based brewing to all-grain. I still had a few extract kits around that I needed to finish up. The Grainfather isn't built or intended for extract brewing. Still, I wondered if I could make use of it so that I could use the excellent counterflow wort chiller (which works a great deal better than my immersion chiller). 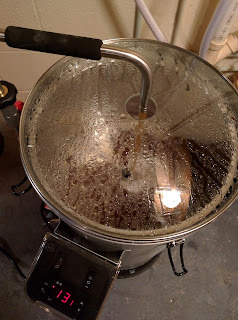 Put 3 gallons of water in The Grainfather and add my steeping grains. Set the steeping temperature and turn on the recirculation pump. While the grain is steeping, on another heat source (such as a kitchen stove) heat 3 gallons of water to boiling and remove it from the heat. Dissolve the malt extract in the water and make sure it's properly dissolved. When the steeping process is finished, remove the grain basket and steeping grains. Pour the malt extract mixture into the kettle and begin the boil. Follow the rest of the recipe steps as you would normally. Using the above procedure and an "economy 5 gallon kettle" I have, I was able to use The Grainfather for the extract beer and rapidly chill it to yeast pitching temperature. The key seems to be to make sure you've dissolved the malt extract in another vessel before pouring it into The Grainfather's kettle. I tried adding extract to the kettle directly, but it tends to collect on the bottom and trigger the scorch protection, so I don't recommend that approach. Besides, scorched extract isn't going to make the beer taste very good. The Grainfather seems to be a well-made, good quality device with solid safety features. It did a great job mashing the grain. After an hour, an iodine test came up clear. The counter flow wort chiller brought my wort instantly from boiling hot to near-yeast-pitching temperature, which should help with clarity and chill haze in the finished product. Cleanup is relatively easy. The supplied electrical cord is just barely long enough to reach the outlets in my basement, which are mounted up off the floor. Because my outlets aren't located near my cold water supply, I have had to use an extension cord to get the unit close to the water needed for the counter-flow chiller and the drain for the hot water. Adding about three feet to the cord would have solved this issue. The scorch protection works very well, but once triggered there is no visible or audible warning from The Grainfather to tell you that. All you'll notice is that the temperature is dropping instead of climbing. As noted earlier, resetting this means tilting your boiler full of hot wort enough to reach underneath and press the button. Having a visible warning and an easier-to-press button would be a big improvement given that I've triggered this a few times now. Because IMake has designed the device to work in a standard 120V outlet, which is a good thing, the wattage of the heating element is lower than it could be. This results in a vendor-estimated boil time of 100 minutes for six gallons of water from room temperature. In my experience (without an extension cord, it should be noted) the boil time for five gallons of water was more like 120 minutes. Fortunately, you're more likely to be raising the temperature to boiling from a mash temperature in the 160F range than from 68F-71F room temperature, so your boil time won't be 120 minutes. Maybe I'm alone in this, but I would prefer that the grain basket be a single-piece item. The use of friction to hold the bottom of the basket in place made assembly a bit of a nuisance and caused me to have to re-seat it after cleaning. If the perforated bottom was part of the basket, that tricky assembly and cleaning step would be eliminated. With the exception of the scorch-protection-reset switch being in a very inconvenient location, none of my complaints about The Grainfather are very significant. If you plan your brew day out carefully, the length of time it takes to finish a batch isn't bad. It's typically 5-6 hours for me, including cleanup time. It's certainly longer than for a propane-based RIMS system, but using a propane system indoors requires some very good ventilation. You can use The Grainfather without that ventilation. I've made two all-grain batches in The Grainfather as of this update (Oct. 2015). The first went absolutely perfectly, and the beer (seen elsewhere on this blog as "Forrest's On-Call Ale") tasted very good. As a first all-grain attempt, I'm happy with it. The second batch, a Belgian Tripel, was more problematic. This was most likely due to including a pound of wheat malt and a pound of oats in that particular beer - without including rice hulls. I had a lot of trouble draining and sparging the grain in that one. My original gravity was lower than expected as well, suggesting that I had some conversion problems. On the other hand, the finished wort looked and tasted great, so although it didn't meet my goals I consider it a success. The third batch done in The Grainfather was an extract based Peanut Butter Stout. As of this update, it's still fermenting but I have every reason to think it will turn out great. If you're looking to switch to all-grain brewing and want a relatively inexpensive way to do it, you should check into The Grainfather. It's less expensive than the alternatives I've looked at, is easy to use, can be operated indoors year-round, cleans easily, and seems to produce good results.